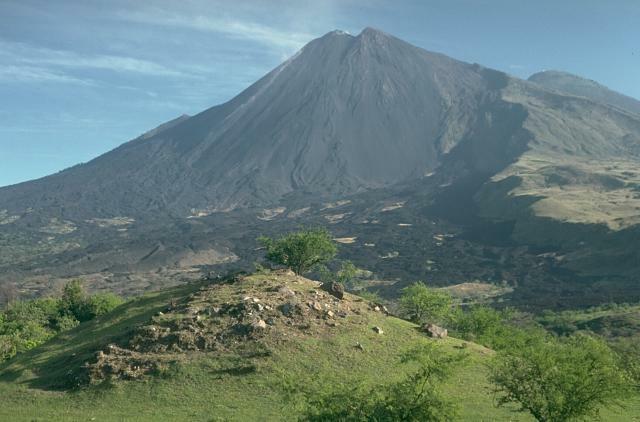 Volcanoes appear to be permanent fixtures on the landscape, but in fact are inherently unstable structures composed of both strong (thick lava flows) and weak (fragmental and hydrothermally altered) materials. 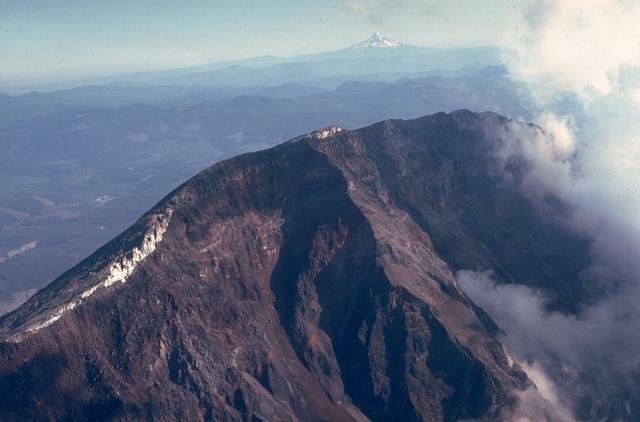 Large-scale collapse of volcanic edifices, first witnessed and documented at the start of the 1980 Mount St. Helens eruption, is now known to be a common volcanic process. 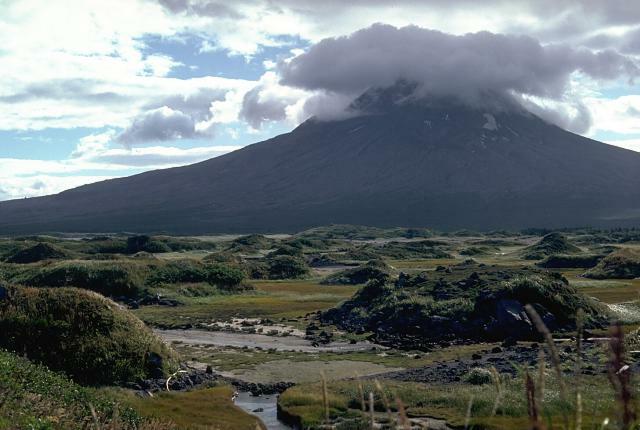 Large volcanic landslides can occur with volumes exceeding a cubic kilometer at continental volcanoes and several orders of magnitude larger at oceanic shield volcanoes. These collapses can produce extremely mobile debris avalanches that can travel at high velocities in some cases for tens of kilometers beyond the base of a volcano. This process, once thought to be extremely rare, has been documented at hundreds of volcanoes worldwide. Repeated episodes of growth and collapse have occurred at many volcanoes, and large-volume volcanic landslides have been found to be the most common catastrophic destructive process at volcanoes. 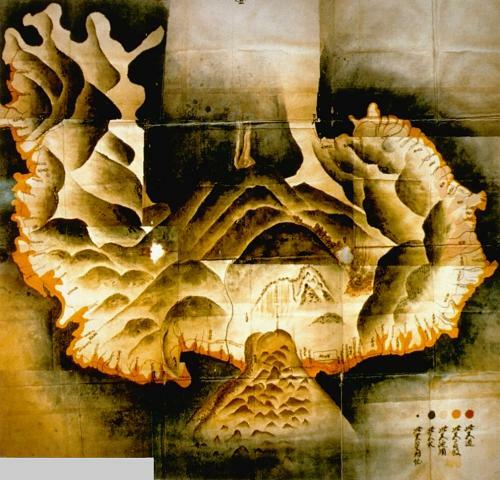 This 18th century water-color map of Unzen volcano on the Shimabara Peninsula shows the extent of the catastrophic landslide from Mayu-yama (lower center) in 1792 that swept into the Ariake Sea at the bottom of the map. The irregular, orange-colored area along the coast delineates the extent of runup of the tsunami that was created when the avalanche entered the sea. The tsunami swept a 77-km length of the peninsula and caused nearly 15,000 fatalities here and along coastlines across the Ariake Sea. Map from Shimabara City Honko temple (published in Miyachi et al., 1987). This outcrop along the Oshira-kawa river east of Haku-san volcano in Japan shows textures that are common at debris-avalanche deposits. Large fractured clasts are carried in a finer matrix that shows variations in color. This results from the transport of small discrete segments of the volcano for long distances without being totally disaggregated and mixed together. 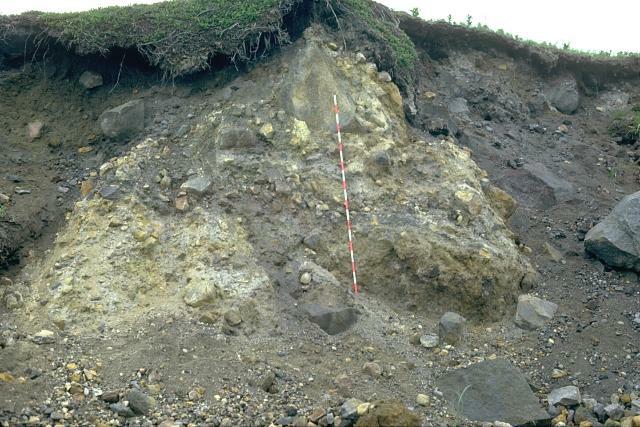 This debris avalanche was produced by a volcanic landslide from the summit and eastern flank of Haku-san about 4200 years ago. Photo by S. Shimuzu (courtesy of Toshio Higashino, Haku-san Nature Conservation Center). The small hills in this photo were produced during a 1956 eruption of Bezymianny volcano that closely resembled the 1980 eruption of Mount St. Helens. 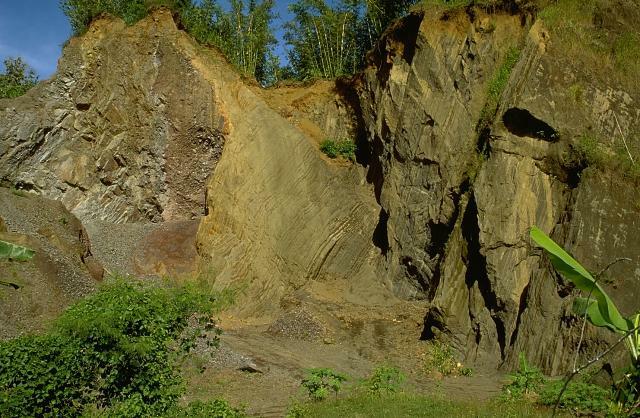 The hummocky terrain is reminiscent of the debris-avalanche deposit filling the Toutle River at Mount St. Helens, and likewise was produced by a massive volcanic landslide when Bezymianny collapsed on March 30, 1956. The hummocks consist of material formerly composing the Bezymianny edifice that swept up to 18 km to the east in a highly mobile debris avalanche. Photo by Dan Miller (U.S. Geological Survey). The hill in the background is one of many hummocks forming the surface of the massive debris-avalanche deposit produced by collapse of the summit of Mount St. Helens on May 18, 1980. 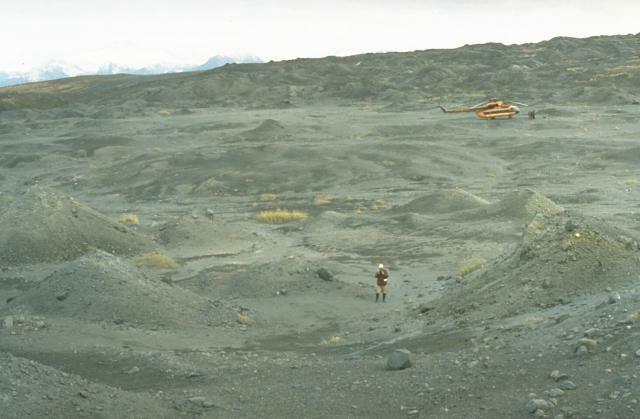 The different-colored rocks represent portions of the former volcano that were transported relatively intact far from the volcano. The avalanche traveled 25 km, filling the upper North Fork Toutle River to a maximum depth of nearly 200 m. The lighter-colored rocks in the foreground are pyroclastic-flow deposits. The shear headwall of the landslide scarp created by collapse of Mount St. Helens on May 18, 1980, towers 550 m above the crater floor. The white areas on the crater rim are glaciers that were truncated by the collapse. 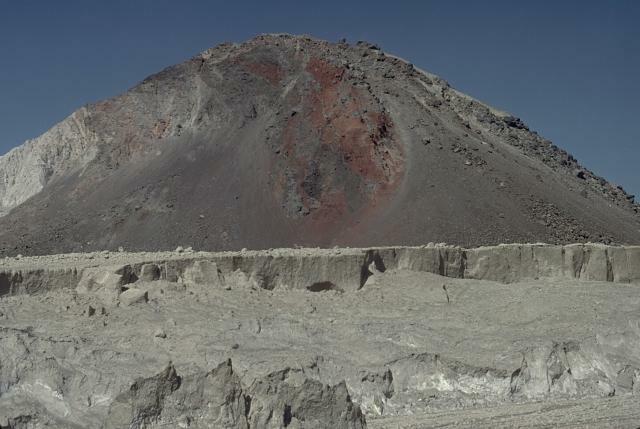 Steam rises at the right from the new crater of St. Helens in this August 1980 view. Mount Hood is visible in the distance to the south across the Columbia River. Photo by Lee Siebert, 1980 (Smithsonian Institution). 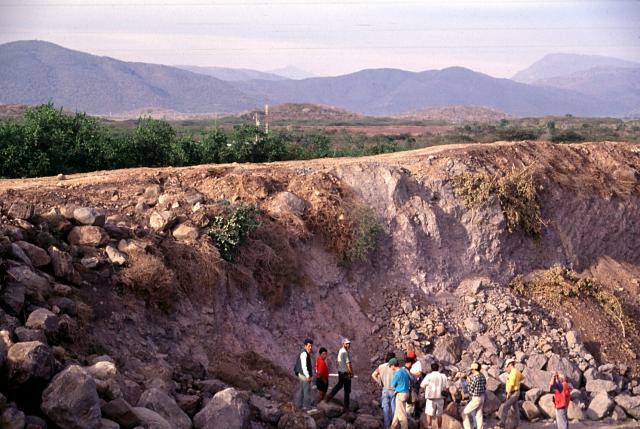 Collapse of México's Colima volcanic complex during the late Pleistocene produced a major debris avalanche and debris flow that traveled 120 km from Nevado de Colima volcano to the Pacific Ocean. The quarried hummock in the foreground and the two brown hills in the middle distance are formed both of debris transported more than 100 km from Colima volcano (seen in the far distance above the lefthand hummock) and material from valley floors incorporated during transport. 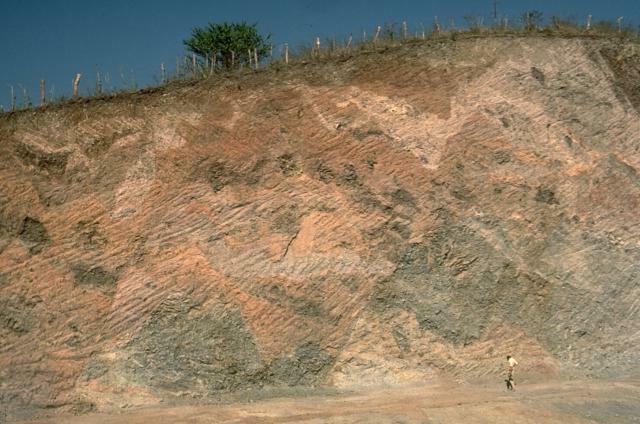 Textures associated with volcanic landslides are preserved in this quarry wall more than 100 km from the source of a major avalanche from México's Colima volcano. 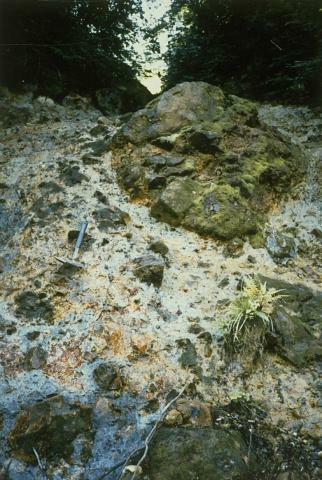 Large fractured blocks appear at the top of the exposure, and a color mottling is produced by adjacent segments of the volcano or valley floor material incorporated during transport that are fractured, but not thoroughly mixed. A 2-m-high measuring rule provides scale. The hummocky surface in the foreground in front of the twin volcanoes of Fuego and Acatenango in Guatemala is a massive Escuintla debris-avalanche deposit produced by collapse of the volcanic complex sometime during the late-Pleistocene to early Holocene. The avalanche, the largest known in Guatemala, has an estimated volume of about 15 cu km and traveled about 50 km. The avalanche traveled for its last 30 km over flat Pacific coastal plain slopes of less than 1 degree, illustrating the extremely high mobility of volcanic debris avalanches. Photo by Jim Vallance, 1989 (Michigan Technological University). This roadcut provides a spectacular section through a debris-avalanche deposit hummock of the Fuego-Acatenango complex in Guatemala. 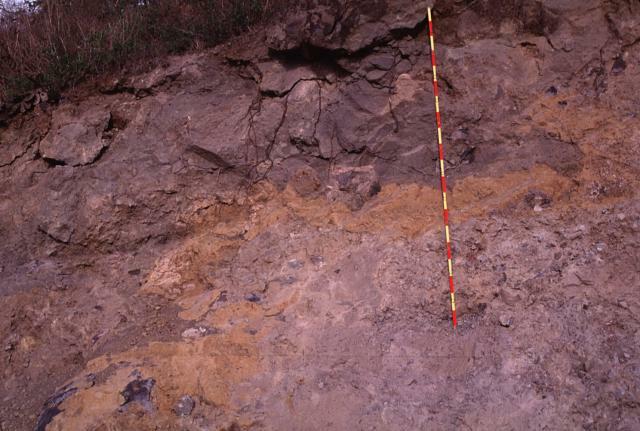 The pronounced color mottling is a common texture of debris-avalanche deposits and distinguishes them from deposits produced by other volcanic processes such as mudflows or pyroclastic flows. This texture results from the transport of coherent segments of the volcano over long distances with only partial disaggregation. Individual lava flow segments and pyroclastic units can be traced across small offsetting faults. 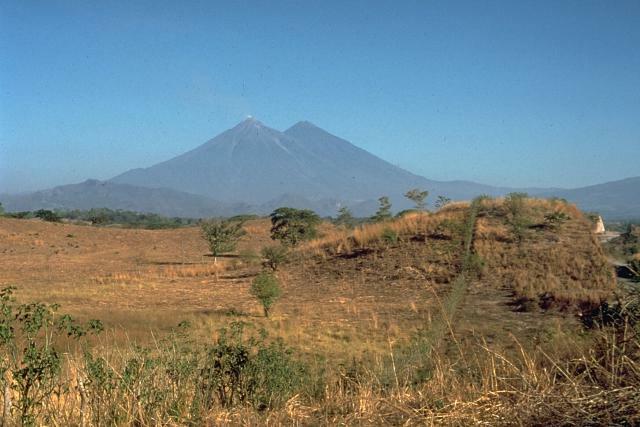 MacKenney cone, the historically active vent of Pacaya volcano in Guatemala, was constructed within a horseshoe-shaped caldera produced by collapse of the summit of an ancestral volcano about 1100 years ago. The SW caldera rim forms the steep-sided scarp at the right, and the small knob halfway down the left-hand skyline is a remnant of the partially buried opposite rim. The blocky hill in the foreground is a hummock from the debris avalanche produced by the collapse. The avalanche traveled 25 km down to the Pacific coastal plain. 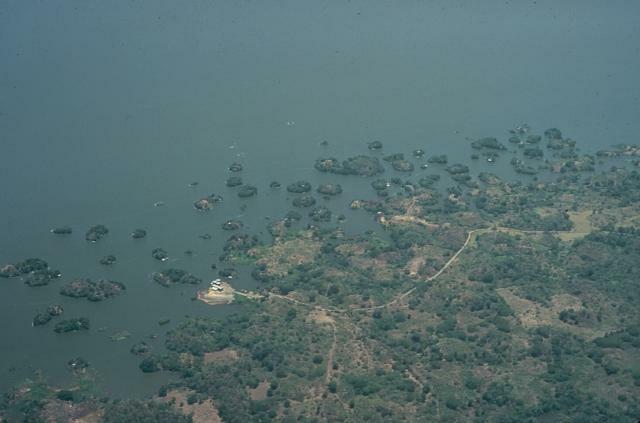 Las Isletas, a group of islands NE of Mombacho volcano, were created by a large Holocene debris avalanche from Mombacho that swept into Lake Nicaragua. The avalanche traveled at least 12 km from Mombacho. The hummocky debris from the avalanche created an arcuate peninsula that extends into the lake as well as hundreds of small islands. This morphology is common where debris avalanches enter shallow bodies of water. Photo by Jaime Incer, 1972.